The most commonly reported measure of the consumer price levels in the United States is the Consumer Price Index (CPI). Published by the U.S. Department of Labor 's Bureau of Labor Statistics. 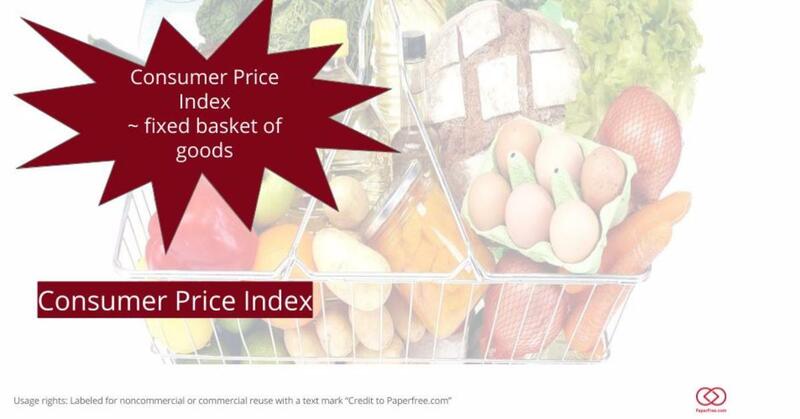 The CPI is a fixed-weight price index using a fixed basket of goods that are representative of what a typical consumer purchases each month. The most commonly reported CPI is the CPI-U, which is the CPI for all urban consumers. Increases in the CPI level serve as a measure of the consumer inflation rate. The rate of inflation over a period of time is simply the percentage increase in the CPI over the period, often reported on an annualized basis. Reference for escalation agreements - labor contracts and other payment agreements that are indexed to inflation rely on the CPI. Deflator for economic series - when a series of data is to be adjusted so that it is reported in constant dollars, the CPI often is used as the deflator. Because of the widespread use of the CPI, especially for adjusting payments to inflation, its accuracy can have a significant impact on the economy. In recent years, the accuracy of the CPI has been questioned due to a number of biases that cause it to overstate the effective rate of inflation. Substitution bias - when the price of a product in the consumer basket increases substantially, consumers tend to substitute lower-priced alternatives. For example, if a freeze in Florida causes the price of oranges to skyrocket, consumers may substitute Texas grapefruits for Florida oranges. Since the CPI is a fixed-weight price index, it would not accurately predict the impact of the price increase on the consumer's budget. Quality bias - over time, technological advances increase the life and usefulness of products. For example, the useful life of automobile tires increased substantially over the past few decades, decreasing the tire cost on a per mile basis, but the CPI does not reflect such improvements. New product bias - new products are not introduced into the index until they become commonplace, so the dramatic price decreases often associated with new technology products are not reflected in the index. Outlet bias - the consumer shift to new outlets such as wholesale clubs and online retailers is not well-represented by the CPI. Some economists estimate that such biases overstate the CPI by about 1% per year. The U.S. Department of Labor has responded to these biases by more frequently changing the base period when the items in the index and their weights are adjusted. Also, the government now is quicker to add new products to the CPI basket and has made quality adjustments to the index.